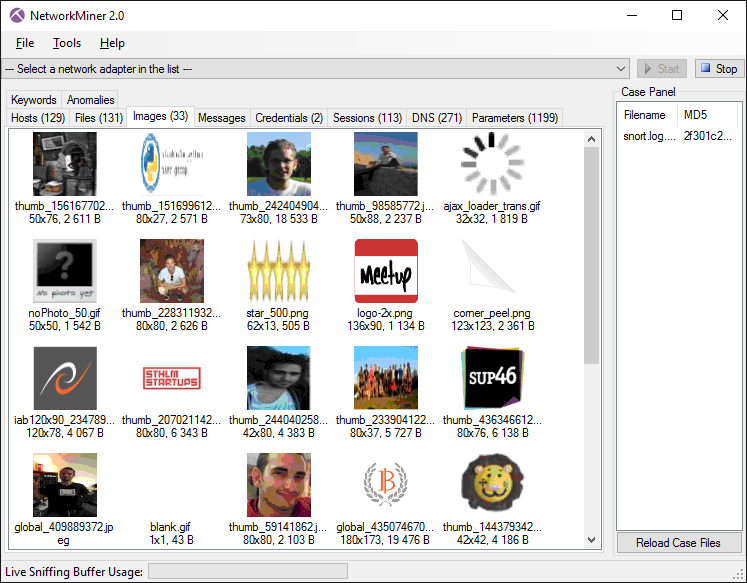 NetworkMiner is an open source Network Forensic Analysis Tool (NFAT) for Windows (but also works in Linux / Mac OS X / FreeBSD). NetworkMiner can be used as a passive network sniffer/packet capturing tool in order to detect operating systems, sessions, hostnames, open ports etc. without putting any traffic on the network. 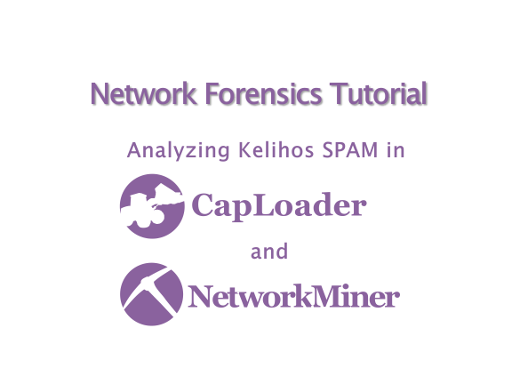 NetworkMiner can also parse PCAP files for off-line analysis and to regenerate/reassemble transmitted files and certificates from PCAP files. NetworkMiner makes it easy to perform advanced Network Traffic Analysis (NTA) by providing extracted artifacts in an intuitive user interface. The way data is presented not only makes the analysis simpler, it also saves valuable time for the analyst or forensic investigator. 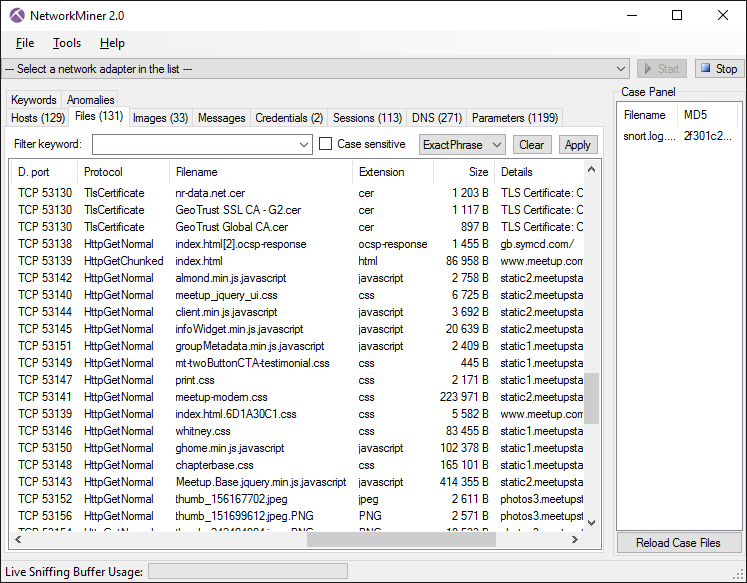 Extract X.509 certificates from SSL encrypted traffic like HTTPS, SMTPS, IMAPS, POP3S, FTPS etc. **** Measured by loading dump.eth0.1059726000 from Defcon 11 (189MB) on a standard laptop with Intel Core i7 CPU (3.1GHz). 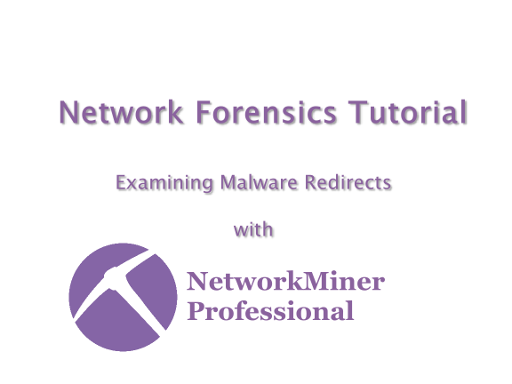 NetworkMiner can extract files, emails and certificates transferred over the network by parsing a PCAP file or by sniffing traffic directly from the network. User credentials (usernames and passwords) for supported protocols are extracted by NetworkMiner and displayed under the "Credentials" tab. The credentials tab sometimes also show information that can be used to identify a particular person, such as user accounts for popular online services like Gmail or Facebook. NetworkMiner Professional comes installed on a specially designed USB flash drive. You can run NetworkMiner directly from the USB flash drive since NetworkMiner is a portable application that doesn't require any installation. We at Netresec do, however, recommend that you copy NetworkMiner to the local hard drive of your computer in order to achieve maximum performance. However, please note that we no longer release new versions of NetworkMiner on SourceForge. 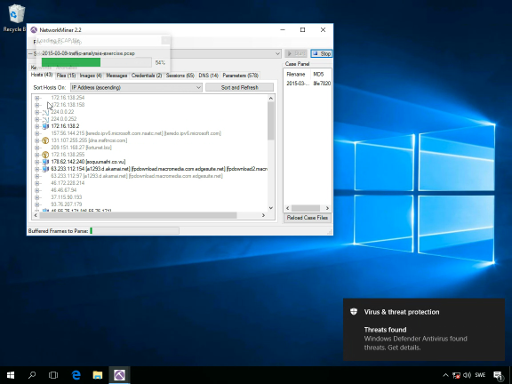 NetworkMiner 2.4 2019-01-10 Username extraction from Kerberos traffic, ICS device fingerprinting and improved Linux support. NetworkMiner 2.3.2 2018-08-27 Improved email and VoIP call extraction. NetworkMiner 2.3 2018-04-03 VoIP call audio extraction and playback as well as OSINT lookups of file hashes, IP addresses, domain names and URLs. NetworkMiner 2.2 2017-08-21 Faster parsing speed (x2) and CASE export. NetworkMiner 2.1.1 2017-01-19 Improved HTTP parser. NetworkMiner 2.1 2017-01-11 New protocols: POP3, IMAP, VXLAN, OpenFlow and SOCKS. NetworkMiner 2.0 2016-02-09 New protocols: SMB2 and Modbus/TCP. NetworkMiner 1.6 2014-06-16 Improved SMTP and DNS parsing. NetworkMiner 1.5 2013-08-07 New protocols: PPPoE and LLMNR, fixed two vulnerabilities. NetworkMiner 1.4 2012-08-16 New protocol: IEC 60870-5-104. NetworkMiner 1.3 2012-04-12 Username and password from HTTP Digest Authentication (RFC 2617). NetworkMiner 1.2 2011-11-19 New protocol: GRE, platform independent (works in Linux, Mac OSX etc). NetworkMiner 1.1 2011-09-15 New protocol: PPP. Screen resolution, color depth, browser language and flash version extracted from Google Analytics. NetworkMiner 0.71 2007-02-16 First public release of NetworkMiner.